When tropical breezes are lightly swaying your thoughts, making it hard to concentrate on your work-a-day world, it’s time to move to the beach! There is no better place to set your inner islander free than in a beautiful Ocean Walk home. This incredible community is only about a mile from one of the finest stretches of sand in Myrtle Beach. 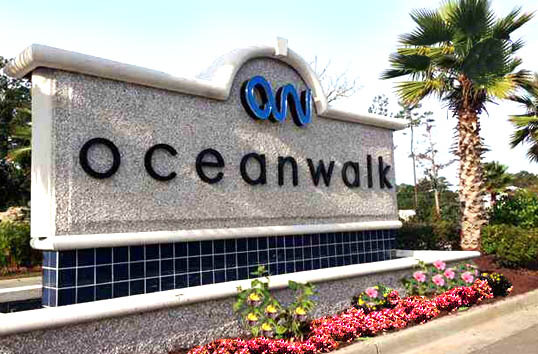 Ocean Walk features a variety of amazing single-family homes and luxury townhomes, offering 3, 4, and 5-bedroom floor plans in sizes of 1500 to 2,900 square feet. These extraordinary homes are constructed by DR Horton Homes and feature standard upscale upgrades like hardwood and tile flooring, granite countertops, high-end cabinetry, stainless appliances, fireplaces and more. Prices run from the upper $100,000s to the mid-$200,000s. The community’s clubhouse has an outdoor pool and a heated indoor pool, as well as a lazy river, fitness room, a fitness room, and much more. Nearby, Myrtle Beach State Park provides exclusive educational opportunities, along with great fishing and lots of fun. The Market Common urban village offers great dining, exceptional shopping opportunities, and entertainment for all ages. And the Grand Strand is a never-ending source of exciting things to do. Whether you are following your dream to live a carefree tropical lifestyle, looking for a stress-free place to raise a family, want to retire to the beach, or looking for a great vacation rental property, this is the ideal place to start looking. Visit our website to learn more and call our real estate professionals with any questions you might have. Don’t forget to schedule a private tour of the Ocean Walk homes for sale and see for yourself how much this community has to offer. What are the Facts about Buying a Home?